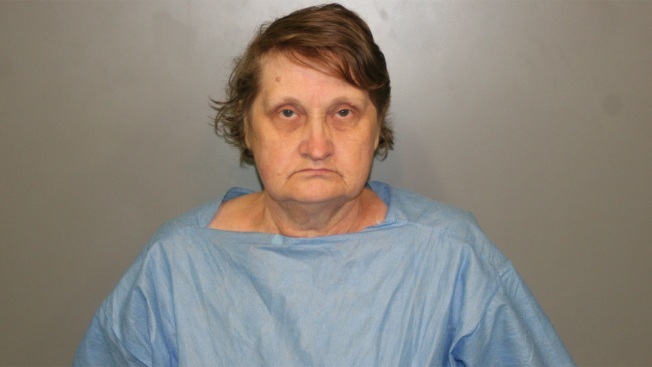 An Oak Lawn woman accused of killing her granddaughter by hitting her with a sledgehammer and slitting her throat over the weekend was admitted to a hospital Monday night. According to the Cook County Sheriff's office, Alfreda Giedrojc was under observation at Cermak Hospital, which is connected to the Cook County Jail. Giedrojc, 61, was charged Monday with first-degree murder and is being held without bond. Prosecutors said the 6-month-old victim's father dropped her off at her grandparents' home Sunday morning to work on a rehab project across the street. After the child's grandfather left the house to check on his son-in-law, prosecutors said Giedrojc put the sleeping baby on the floor and struck her with the sledgehammer. "The defendant placed the baby on the floor and retrieved a sledgehammer from her closet which she had placed there the night before," Assistant Cook County State's Attorney Michael Deno said in court. "The defendant then hit the victim repeatedly in the head and body with the sledgehammer." After the vicious attack, prosecutors said, the baby was still crying and moving. Prosecutors said Giedrojc retrieved a knife from the kitchen. "The defendant then picked the victim up, held her and then slit her throat with the knife," Deno said. Police responded to Giedrojc's home at about 10:45 a.m. Sunday after receiving a call of an armed subject and a severely injured baby. The infant was taken to Advocate Christ Medical Center in Oak Lawn where the child was pronounced dead at 1:48 p.m., police said. "It's a tragedy," Oak Lawn Police Chief Michael Murray said. "Our thoughts and prayers go out to the family." Investigators would not talk about a possible motive if any. Giedrojc has lived with her family in Oak Lawn for 20 years and her neighbors said they cannot understand why this happened. Next door neighbor Caren Hennessy was shocked to learn of the death. "It's a funny world we live in right now. A lot of people are so tense and angry and people do things that maybe they wouldn't do in another time," she said. Hennessy has lived next door to the couple who lives at the home, now a crime scene, for 11 years. She described the family as "lovely people" and "very friendly." The Village of Oak Lawn and staff from police, fire and emergency communications departments said they wish to express "thoughts and prayers for the family during this most difficult time."